As much as I tried not to spill anything on my beloved MacBook Air, last month I knocked over a cup of coffee, getting almost all of it over the keyboard. I feared this would happen, but I did not think it would happen to me. I'm super careful with any coffee, soda or water that I bring to my desk. But, the thing I dreaded the most happened. There was coffee all over the keyboard, touchpad and the left side of my Mac. It is not a pretty sight, unless you are dying to get a new laptop -- which, really, wasn't the case. Knowing that liquid damage can be the end of it, I quickly powered it off, turned it upside down, and the coffee started to drain from it. With a bit of luck, I knew that I could fix it. And I did. Here is how I did it and what I learned from it. First of all, it is important to know that you need to power off your device immediately after the spill. Do not power it back on until you have cleaned it. I cannot stress this enough. If you rush it, you could fry the internals and then it's game over. So, prepare yourself for being without your laptop for at least a couple of days. Unplug the power cable and remove the battery, if possible. 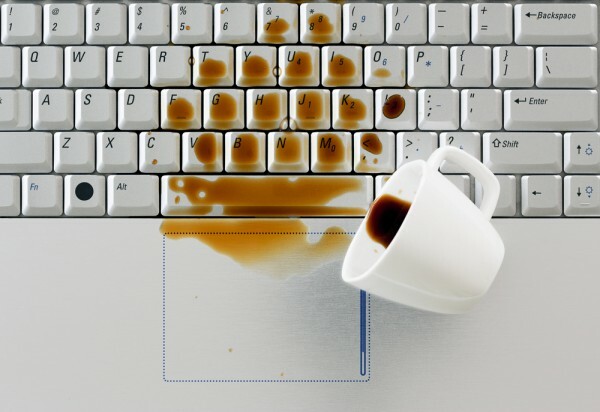 What sort of liquid you spill on your laptop makes a big difference. Water is less problematic than coffee or soda, because it can naturally evaporate and leave no visible residuals behind. Meanwhile, drinks that have sugar in them can cause more damage, because the sugar will stay inside, on the components, even if the liquid dries out. And sugar and other substances will slowly but surely damage things. That is not to say that you can send the laptop for warranty repairs after it has dried inside, because, chances are, the manufacturer likely added some liquid damage indicators in key areas for this very purpose. And you will end up with a denied claim or a very expensive bill at the end. If you expect that, fine, but otherwise don't think the folks doing the repair will not be able to tell. I do not have a chemistry degree to tell you exactly what substances will affect electronics and how, but based on what I have read, as a general rule, you do not want to simply let it dry -- or dry it yourself -- and think that will do the trick. This is where you will have to make a decision. You can either choose to send it to a shop to get it sorted out or you can try to deal with the spill yourself. I went the second route, as I am familiar with what's inside of a laptop and how to take it apart and put it back together. I've done that a couple of times before, mainly to clean the dust around the fans, and I was confident I could do the same with my MacBook Air. Now, it pays to have all the right tools and some prior experience working on laptops, but, if that is not the case, you should know that it is not rocket science. No, not everyone can do it, but there is lots of information on how to disassemble and reassemble laptops -- maybe even yours in particular. If it's a Mac, chances are you are covered. For other brands I cannot really say if that's the case for all models, but you can still get an idea of how it's done by looking at other devices and being careful. Whatever you choose to do, know that I will not be held responsible for any damage that you may cause or have caused. If you do not trust your skills or yourself, take the laptop to someone who knows how to handle it. However, you should still turn it upside down on a table, with the display at a 90-degree (or larger) angle so that no liquid gets to it. Then, put some paper towels underneath the keyboard to absorb any liquid that drains around the keys. This helps regardless of what your plan may be. After you find a shop to take care of it, take it right away to have it checked, cleaned and repaired, if needed. Getting back to the do-it-yourself route, I mentioned having the right tools as being really important. That sounds obvious, but it may not be immediately apparent what exactly you need. Macs, for instance, don't use common screws to hold the back cover, as Apple opted for the Pentalobe type. Don't be fooled into thinking that you can get by with a different kind of screwdriver. If you damage the head of the screw, you may not be able to remove it. And that, as you can probably imagine, is not something that you want to deal with, on top of the liquid that's inside. Quite possibly, you don't have the right Pentalobe screwdriver around (or any Pentalobe screwdriver, for that matter), but you can source one online. Of course, that's not all you need. If you also have a Mac, iFixit has a guide for everything you may want to do, which includes all the tools that you need for the job. Check the complete disassembly guide for the full list. In the case of laptops from other brands, you will have to do some digging yourself to find out exactly what you need before tackling this project. Check the forums, YouTube videos, and whatever else you can find. You may not need all the tools right away, but when you do need a specific one and you don't have it it will hold you back and you may be tempted to find a way around it. Don't. What you will also need is isopropyl alcohol and, possibly, distilled water. The former is recommended for cleaning electronics. The latter is good for getting the sugar off of the insides. If you only spilled water, you will not need the distilled water also. How much should you get? Well, that depends on how big your laptop is, the number of components and how large they are. For my slim MacBook Air, I used about 1.5 liters of isopropyl alcohol and two liters of distilled water. Read on to better understand how much you will need. If you want to clean your laptop properly, you will have to take it apart completely and clean every single component that's affected. The exceptions to this rule are the battery and the display. You do not want to clean either of them using isopropyl alcohol or distilled water. In the case of the battery, if it's internal, you could damage the cells or short circuit it. The display, on the other hand, will be effectively ruined by the isopropyl alcohol or distilled water, as it gets between the layers in the panel. It might still work, but you will see the liquid and that is not a pretty sight. It is important that you wear antistatic gloves or a grounded wrist strap, as even if the liquid did not damage the laptop you could still cause permanent damage when static electricity from your hands is discharged on the components. The first thing that you want to do if you have a laptop with an internal battery is to remove it before doing any further work on it. So, take out the back panel and everything else you need to get to the battery connector and unplug it. That way, there is no chance of something getting short-circuited or electricity being conducted by the liquid as you move the laptop. With that out of the way, what you want to do next is disassemble every single component and put it somewhere where it can be cleaned or stored until you can do it. Pay attention to the disassembly instructions, so you do not accidentally damage something. I made the mistake of rushing and broke a speaker connector as a result. Don't make the same mistake. Take your time, make sure that you do it by the book. I should note that it is not necessary to take it all apart, but you may not know exactly which components the liquid got to. If you remove all the components and clean them, you will know for sure that there is nothing left behind. That's what I did. Even if I did not want to do it, I was forced by the MacBook Air's internal design anyway. MacBooks are slim, and there is a reason why: components are stacked, linked together by long cables, there are things going from one side of the device to the other, and so on. So, you do not really have any options but to disassemble everything. I also detached the display, so that I could properly clean the keyboard and the rest of the body, without the risk of damaging the screen. I should note that if you remove the heatsink that's over the processor, you will have to remove the thermal paste and apply a fresh layer. It is a good idea to do it periodically anyway, and now is as good a time as any. You have to apply the layer over the processor -- and any other components where it was previously applied, if that's the case. There are specific instructions online on how to do it, but, as a general rule, you want to apply as little as needed -- enough to cover the surface of the processor but not so much that it overflows once the heatsink or cooler is installed. After taking everything apart, you can proceed to the next step: cleaning the components. What you need to use and how you use it depends on the liquid that you spilled. If it's a sugary drink, I recommend using the distilled water first so that the sugar can dissolve. In that case, you can use a soft brush to gently clean the components. If it's water, you can use isopropyl alcohol only. It will absorb the moisture and remove substances that can damage the components in the long run. How should you clean the components? Since I spilled coffee, what I did was put them in a cooking pan and cover them completely in warm distilled water to dissolve the sugar. For good measure, I cleaned them a couple of times and replaced the distilled water after each clean. That way, you avoid getting the dissolved sugar back on the components. But, remember to heat it up first. You want the distilled water to be warm so that it can dissolve the sugar efficiently. Regarding the temperature, around 30 degrees Celsius (or 86 Fahrenheit) should be enough. There's no need to go higher than that. You can get a feel for the temperature with your finger. I warmed it in a pint glass in the microwave. Remember to also clean the keyboard, because if you spilled a sugary drink over it there will be some sugar left around or underneath the keys. If you do not dissolve it, you will end up with sticky keys. That's annoying, but simple to fix: drown the keyboard in distilled water a couple of times. I went a step further and removed the keys and cleaned them individually with a toothbrush in warm water. You don't need to use distilled water in this case, as the plain water will not damage the keys. Let them dry out before putting them back, if you want to do this. After that, I cleaned everything again, but this time using the isopropyl alcohol. Just to be safe, I did it a couple of times. You will want to let the components dry out naturally before reassembling them. How much it takes depends on a number of factors, but the most important are the room temperature, ventilation, and humidity. I don't recommend using a blower, because it will not reach every nook and cranny there is. You may be tempted to think that it dried everything and learn the hard way that that wasn't the case. The warmer the air in the room is, the faster they will dry. If the room is ventilated, you will accelerate the evaporation process. If the air is dry, it will have the same effect. What you do not want is to keep the components in a cold room, in a closed box, with high air humidity. The liquids will still evaporate, but it will take much, much longer. Isopropyl alcohol evaporates quickly, much more quickly than water, but you should keep in mind that it has reached every nook and cranny, and, as a result, it may take a while before it evaporates completely. I have seen people recommend waiting a week, just to be safe. I would do the same if I were you. This is where I made a mistake. I rushed to put everything back together and power it on. Everything worked fine, but in the process I damaged a cable connecting the I/O board to the logic board. I couldn't charge the battery nor connect any USB devices using the left port. Thankfully, a friend offered to fix both the connector I broke, that I mentioned earlier, and the I/O board cable and everything was all fine again. In the process of reassembling my Mac I also forgot to connect the fan to the logic board. It may sound like a fatal mistake, but thankfully the device knows when it gets too hot and shuts down to avoid any damage. So, while you are at this stage, make sure that you have connected and installed everything correctly before turning it back on. There are no guarantees, but I took my chances, cleaned it, and it is all working perfectly fine now. You need a bit of luck, I will not lie to you, as anything can get fried when the liquid gets inside of the laptop or get damaged when you're working on it, but if there is even a chance that it will work you should take it. I like fixing things, so for me cleaning it myself felt like the natural thing to do. But, there are some things that I will not touch, like the I/O board cable I mentioned above. You really need to know what you are doing and how to use specialized tools for that, which is why I asked for help. This brings me to something else. If it is not working correctly after putting it back together, you should take it to a service or someone who can figure out exactly what is wrong with it. Laptops may look simple once you have all the components in front of you, but they are very complex in reality. You may luck out and find out what is wrong with it just by looking, but that is not always the case. I suspected that it was the cable that got damaged. Why? My Mac didn't charge the battery, but it did run off the power adaptor. The USB port didn't allow for data transfer, but it charged devices connected to it. The headphone jack, which is on the same board as the other two, worked fine, as I could play music on my speakers. The lid sensor, which tells the device to turn off the screen when the lid is closed and power it on when it's open, didn't work either. Some pins got damaged, likely because I did not wait enough for all the liquids to dry out before putting everything back together and powering the laptop on. I ordered a replacement from eBay, but since my friend managed to fix the OEM cable I am still using it. If it fails, I'll replace it with the spare. Ultimately, what you should take away from my mistakes is that you need to be patient and careful. If you are cleaning it, you might as well do it well and take your time. The payoff is worth it.